A few weeks ago, Josette asked if anyone had a healthier, homemade corn dog recipe. Yippee! A recipe challenge. I love me a recipe challenge. I’ve found some hot dogs from Azure Standard made by Shelton that are pretty good. They are made with chicken, don’t have any preservatives, etc. If you have access to those, give them a try. We like them just fine. And – hot dog on a stick with yummy cornbread fried all around it? Hello. I am my kids’ favorite mom on days I make these. Whisk together all ingredients (okay, except for the hot dogs of course...and the oil for frying...and the lollipop sticks). Holding onto the stick "roll" the hot dog around in the cornmeal batter to coat. Place the corn dog down onto the hot oil. Allow the corn dog to cook quite well on one side before attempting to turn it so that the batter won't pull off. Turn as necessary to cook on all sides. My corndogs don’t turn out very lovely. They’re sort of triangular in shape. Ah, but they taste delicious! Wait until you hear THIS idea. When Jennifer heard that I was going to conduct a corn dog experiment…she gave me this idea!!! Thanks Jennifer! These Corn Dog Muffins are a perfect way to avoid the mess of frying your corn dogs and finding lollipop sticks, etc. I LOVE this! Mix up the cornbread. Cut hot dogs into thirds. Scoop cornbread batter into the paper lined muffin cups. Place 1/3 hot dog into each muffin. Bake at 400 ° until golden brown. Serve right away. Look! You can’t even tell there’s a hot dog in those muffins! You could surprise your kids with these! They’ll think they are only having a cornbread muffin for lunch. Then tada! There’s a hot dog inside! The best thing about these Corn Dog Muffins is that they freeze well!!! Just thaw and reheat in the oven for a few minutes before serving! How’s that for an easy lunch idea that you can make ahead of time?! What fun ideas! I’m gunna try the muffins and also freeze some for later! How wonderful! Thanks. How fun! I am glad that you got to try it! :) Thanks for the freezing tip. I am thinking it could be a fun meal for when we go camping in a few weeks. It would be great to take a bunch of frozen muffins to reheat later. I was thinking of ordering some of those Shelton’s turkey franks this summer for quick BBQ meals. I discovered that they’re gluten-free, and Azure has them on sale for June/July! :) I love the idea of the muffins; I may try that with my gluten-free cornbread batter. Thanks! What a great idea! I’m going to make up a batch this week and freeze some up. I have a newborn and this would be a quick and easy meal for the other 3 kids! I love the muffin idea! I get nervous “frying” in oil….! Thanks! These look so yummy and fun! I made your frozen pizza pockets the other day and they are brillant!! My family and I had the best time eating them and thinking up all the yummy fillings we could put in them. I always do the same thing as the corndog muffins. Except I chop my hot dogs it little pieces and stir them in the batter. That way there are hotdogs in every bite instead of one hot dog in the center with all this extra batter around. I bet my kids will LOVE this =-)! Amazing idea! I’ll try it on the kids, but won’t tell them there’s a surprise inside! They’ll love it. AH, we love the John Morell Naturals… YUM! we like to do it in MINI muffin cups… cut the hotdog into 8 parts… and push them into the mini muffin cups… after you put in 1 T. mix… bake! YUM!!! pop them into your mouth!!!!! Oooh, those muffins are a *fabulous* idea! Those are great recipes and tips! Thanks! I do the corndogs in the muffin, but have found it is better to dice the hot dog into small pieces and mix within the batter. This ensures that you have a hot dog piece with every bite. Placing a hot dog in the middle often causes you to have more muffin than meat. This doesn’t work well when one has a husband who loves his meat! Great idea! This would be great for a cookout or a birthday party. Thanks. BTW, your homemade cheese cracker recipe is simply my favorite homemade recipe. My kids love them, it’s cheaper and healthier than buying crackers, and they’re so easy to make. Thank you! Another quick and easy idea for home made healthy corn dogs: Use one of those canoe shaped baking pans (you know, the ones that make twinkies hehe), pour some batter in, place a trimmed hot dog (if the whole hot dog doesn’t fit- I think some will and some won’t), and fill with more batter. Bake and you have a healthy corn dog that also freezes well for a quick lunch! I do the same thing I fry them in my skillet (the corndogs) sideways to preserve my precious oil! I have found also to dust the hotdogs with flour does help the batter stick better. I have tried so many of your recipes and they all come out delicious and our filed away in my cookbook. Thanks!! What a fabulous idea!! I can’t wait to try it, I know my family will love them. My kids will love this idea, and dicing the hotdog helps eliminate the chokey factor while spreading it throughout the muffin. Great idea, way cheaper than the ones they had while out last night. Do you let the hotdogs from Azure thaw out before using?? I thought they were supposed to stay frozen? 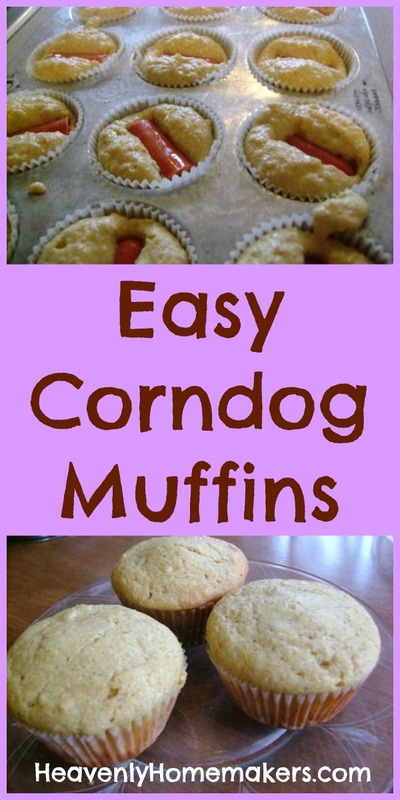 OMG, I love those corndog muffins idea. How cute are those? I made corndogs this week too! I’m loving the muffin idea, I need to give it a try. I will definately be making these soon-they’ll be a great treat! Thank you. will try the muffins….thanks for sharing. Thanks for the corn dog muffin idea. I have a batch in the oven now. My corn dog loving husband is going to love them! I think they’ll be great for quick lunches! Oh my goodness, that corn dog muffin idea is genius! Those will be perfect in DD’s school lunch. Wow – now there’s a nifty idea I’ll have to try! I’ve never been a corndog fan but this might convert me — I love corn bread muffins and hot dogs! Just wanted to mention that Applegate Farms has a Grassfed Beef Organic Hotdog — mmmm, mmmm, good! Also, I was wondering – where can I get some cornmeal that isn’t GMO?? Oh Awesome. I have lollipop sticks. And I have hotdogs. And I’ve got some Bob’s Red Mill Cornbread mix. We’re having this for dinner tonight :) Thanks so much. I’m making these tonight, btw! I added in a little more honey, and used 1/2 white flour and 1/2 wheat flour. I think next time I’ll add in something else to make the muffins a little more sweeter, they’re a little bland this way (I tried one). I also diced the hotdogs and added in 10 instead of 8. We’re going to have them tonight for a picnic at the park…here’s hoping the kids like them! Another one I can’t wait to try…those muffins look great! What a perfect thing for school lunches!!! I’m so glad you posted this! I made the corn dogs (chicken dogs) on a stick today using bamboo skewers cut in half because I didn’t have lollipop sticks. My children and I gobbled them up! I made these again today because my husband asked for them. I did not measure the ingredients and the cornbread mixture was too thick and heavy and they were much harder to cook. I tried adding more milk but that didn’t seem to help. I’m not sure what I did wrong. So much for shortcuts! Love this recipe. I have to doctor this recipe up just a little. I dice the hot dogs, add ketchup, mustard, garlic powder, onion powder and cheese. Thanks for the recipe. Hi, just wanted to say thanks for the inspiration. I made up something similar to your recipe and the kids loved it! Thanks again. Wow!!! I love the corndog muffin idea! I haven’t had a corn dog since I was a teenager….but just recently I had a hankering for one! Perfect timing And my boys love hotdogs and corn muffins…so I !think they’ll be thrilled to have them together! Can’t wait to make and freeze some of these….and how exciting is it to have a new lunch idea! So long pb&j…for now anyway! Hi, I just wanted to say that I love your site. And I love your cheerful attitude. So nice to finda cooking site that promotes healthful eating. I’m enjoying your fun website! Thanks for the corn dog muffin idea! My boys LOVE corn dogs but I so often feel guilty (and rightly so!) feeding them the frozen store bought kind. Now I can make them healthier at home! I made the mini corn dog muffins last night but diced up the hot dogs like someone suggested and they were great. Next time I’ll get two boxes of the muffin mix but my kiddos thought they were just the best things ever. The corn bread hot dog idea was a hit. We cut up the dogs and poured the mix over them in a 9 inch circle baking pan because we have no other way of baking. Tragedy I know but was a complete success! It was a great idea and very filling. Yes, these freeze very well! I love this recipe for the corn dog muffins (and your whole website, really!). One question for you – when I made this recipe, the muffin part stuck to the liner, so we ended up losing half of the muffin part. How do you keep yours from doing this? Yes, this has happened to us before too! Usually if I let them cool a little before peeling off the paper,that helps. Or, I’m thinking I may just skip the papers all together and just butter my muffin tins really well instead! I made your corn dog recipe tonight and it was SO good! I haven’t had a corn dog since I went gluten-free dairy-free 10 months ago. You made my week!! I saw your recipe months ago and have wanted to try it. I just substituted the wheat flour with a GF flour mix and used rice milk. I also saw your recipe for chocolate chips! If you buy them GFCF from the store they are either very expensive or really cheap and terrible, so I can’t wait to try your recipe. Thanks!! Made a dozen of the corn dog muffins and a dozen of the sloppy corn muffins today – couldn’t wait to try them!! They were very yummy and my boys loved them, but I don’t think I pressed the dogs or sloppy joe far enough into the muffin. They just sort of sat on top. Didn’t affect the taste at all, though! And now I have some in the freezer for later! I can’t wait to make them again and perfect the technique. I love your recipes – Thank you for sharing so many!! Thank you for this recipe. I like the thought of the corndog muffins even better since there is no messy frying involved. I just finished the last corndog last night and was thinking how I need to get more but making them is so much cheaper! I have what is probably a stupid question. I don’t make cornbread but wanted to make these. I bought just plain old yellow cornmeal. But my muffins look nothing like yours. They didn’t rise and they look like wet cornmeal. Did I get the wrong kind of cornmeal? All the others said self rising and I didn’t think I needed that. Not a stupid question at all…I use freshly ground corn meal and I’ve heard from others that my recipe doesn’t always work for them when they use corn meal from the store. :( Maybe just try using your favorite corn bread recipe and stick the hotdogs in to see if that works better? My husband just ate three of these and said they were the best things ever! I couldn’t fry them fast enough! just made these as muffins, but they stuck to the wrappers (and so did your chocolate muffins). Do you use special wrappers or spray the wrappers? Otherwise they were YUM! but so much of the cornbread was wasted bc it stuck to the paper…. any tips? I’ve been having trouble lately with mine sticking to the wrapper too…I think next time I’ll just butter the muffin pans really well and avoid using paper liners! When I started baking gluten-free/dairy-free, all of my muffins started sticking to the wrappers. I use the aluminum wrappers and don’t have a problem anymore. I find that letting them cool a bit before removing them from the wrappers helps. When they are completely cool I have no problems with sticking. But then we have to heat the muffins back up? Most of them are to reheat and eat later anyways. I would just pop them in the toaster oven for a couple minutes. Try just letting them cool slightly, but not all the way as well. Or simply give in and grease the pans I suppose. Mine stuck also, and I’ve never had that happen before. Sticking to wrappers depends on the ingredients in the muffins. I haven’t sorted it all out, but some recipes will stick and others will not. I wonder if slightly decreasing cook times for the muffins would help the sticking… Seems to me that maybe the bottoms are cooking quicker than the rest. I am making these right now and slightly decreased the temp of my oven. whoops. meant cook temp, not time. About the liners sticking…I always go without them OR spray the liners with some cooking spray. Very little will stick to the wrapper! Thanks so much for the great recipes. I recently made the Corn Dog Muffins, since I have 3 young children, I thought that I would make them into Mini Corn Dog Muffins instead. They were awesome! I just cut the hot dog into 5 pieces instead of 3 and they fit perfectly into my mini muffin pans. My kids just loved them! hi! Love your blog. Do you have a good source for non GMO corn to grind? I grind my own wheat and havn’t been able to find a good corn source. I havn’t looked to hard either but I thought I would ask you! It seems most corn these days is GMO. Thanks! I order mine through my healthy food co-op Azure Standard. I’ll try to look into other sources to recommend also. UNFI also sells grains like corn and wheat but we use Azure the most. So you can grind popcorn and use it as cornmeal? Yep, my whisper mill actually tells you to grind popcorn to ungum the grinder so to speak. Healthy Cooking from the Hopkin’s family is where I learned to use the popcorn as cornmeal. Works great! I just made these (corn dog muffins) for the first time for my kiddos and just wanted to let you know THEY LIKED THEM and asked for a 2nd serving. Yippee! Another health(ier) quick (out of the freezer) lunch idea for the kiddos. Yippee! Thanks, Laura! Hi! I haven’t posted here before but I saw your healthier corn dogs and thought it was too funny! This week I came up with a recipe for healthier corn dogs! I LOVE the corn dog muffin idea! My kids would get a kick out of them. Thanks for sharing! We wanted to make some Southern recipes for my daughter’s “going away” party. She moved to Nashville, Tenn. Among other things, we made the mini cornbread dogs. I used the mini party dogs that are just the right size for a mini muffin cup. I sprayed the muffin pan and they came out perfectly. If I serve them at coffee hour, I’ll try using papers and spraying the papers. This is similar to my recipe. I think it’s the buttermilk! They don’t fall apart as some do. Right, because the hotdog takes up space, I use half the cornbread recipe. Or, if I use a full corn bread recipe, I make twice the corn dog muffins. Has anyone tried to make these just using jiffy cornbread mix? I’ve never tried, but I don’t know why it wouldn’t work! That’s how I make them, 2 boxes of Jiffy, mix in 2 T. brown sugar and then add your milk and egg mixture. I also slice up mu hots dogs in small pieces…my grandaughter thinks they are awesome; I think they are pretty good too! come out great! I do spray the paper cups so they don’t stick! Can you freeze either of these? I’ve never frozen the corn dogs, but the corn dog muffins freeze wonderfully! I am placing an order with Azure (my 1st order) yay! If I buy bulk corn can I use it to make popcorn and grind it in my grainmill to make cornmeal? What do you buy to make cornmeal and popcorn? I always just grind popcorn for my corn meal. Just found this recipe …can’t wait to try it!!! Wow!!!! I made the corn dog muffins last night for dinner and everyone LOVED them!!! What a fabulous idea! They were easy to make too! Thank you for this fun recipe! Laura, I tried corn dog muffins with my family and they loved them! Thank you so much for the idea!! I made some mini ones (for my toddler) and some full size ones for my husband and I. For the little ones, I cut the hot dogs into pieces (like you normally would for a toddler so they don’t choke) and sprinkled them on top of the mini muffins. Even my hubby and I liked the mini ones better because there were no bites without hot dog like there were in the big ones. Super yummy though, definitely making them again! Awesome idea! I’m about to try that. Thanks! My kids loved these, but the hotdogs floated up to the top as the muffin rose, even though I pushed them down when placing them in the dough. Am I the only one this happened to? This happens to me sometimes too. Silly hotdogs don’t always like staying where they’re supposed to stay! I just found your website a few weeks ago, and have tried a few of your recipes. These were an absolute hit this evening! My 12 yo son love corn dogs, but I’m not willing to make them very often. The cord dog muffins are an amazing solution to that problem! You are obviously very inspired! Thanks again! less expensive than the more expensive brands. Made these today for lunch. Batter came out beautiful! My kids call these Awesomeness! What a brilliant idea! I am going to make these for the kids (teens) lunches today, and see what they think! I like the idea of making them ahead of time, freezing them, and then the kids can re-warm them when they are hungry. Thanks for the fantastic idea, and keep em coming! I have found that foil liners will frequently release muffins (or even brownie cupcakes)a lot easier than any of the paper liners will. A lot easier than cleaning the pan. Im not totally sold on the silicone – it doesn’t seem to bake the same way. I tried using it w/ a cake mix and the texture just came out really weird and not as yummy as it normally does. i made the corndog muffins, which tasted pretty good. are the muffins suppose to end up with a hole and the hotdog keeps sliding out? Sometimes that happens to mine too – we just have to hold the hotdog in with our finger when we take bites! I’m going to try the “muffin technique,” but I’m going to “nuke” my franks a minute to get some of the oil and water out of them — maybe that will help the muffins to rise better. Also, I will probably use Jiffy cornbread mix; I know it’s a little on the sweet side, but I think it will be OK. I just wanted to say that I made the muffins with store-bought corn meal. Per batch of mix I added 1 1/2 tsp baking powder and 1/2 tsp baking soda. This helped them rise nice and fluffy. Just an fyi, it’s also best not to mix the batter dries and liquids until the oven is preheated and your muffin tins and prepped. If you make them sit too long, the reaction between the baking powder/soda and the buttermilk can flatten out. I’ve made this mistake with a few baking sessions, it’s so disappointing!! Also, thank you for this recipe!! I’ve been wanting to make healthier homemade corn dogs for forever! It was sooo tasty! Next time I’m also curious to add a bit of shredded cheese and a bit of sauteed onions . I’m trying the Corn Dog Muffin recipe for lunch today…can’t wait. Thanks! I have made these, but a little different: made in a small casserole dish, sliced the hot dogs long ways in half, then made the jiffy corn bread mix, put in 1/2 of the mix in the pan, then placed in the hot dogs, then placed the other 1/2 over it. Really feels like corn dogs, and the 1/2 slices works for my young children. bonus only took 4 hot dogs to feed everyone, really streched the dinner. I am interested to try with homemade cornbread! These are on my list to make for the freezer! These corn dogs were a big hit for my kids. My 4-yr old normally will not eat “regular” corn dogs but she raved about these. I altered the preparation a bit by soaking the flour in 3/4 c. clabbered milk for 24 hours. When I added the remaining ingredients, the batter was thick so I put in an additional 1/4 c. milk. They turned out wonderful and the leftovers will make a fantastic and easy freezer meal as well. Can smell these baking right now! Literally, I have then in the oven. My boys are excited to try them for lunch :). Thanks again! I made the corn dog muffins and wrote about them here. I really like them in concept, but we had a hard time adjusting to the flavors of the whole wheat cornbread. We love whole wheat, but it was almost too dry in the cornbread. Did anyone else have that problem? I used Bob’s Red Mill coarse ground/polenta cornmeal. Maybe that was the problem? I just made these last night. I used Jiffy corn muffin mix, and I chopped the hot dogs up into little pieces rather than put one big chunk in. That way pretty much every bite had hot dog in it. I took them to a Wii party and they went over like gangbusters! I will definitely be making them again. Also, I used Reynolds foil cupcake liners so I could cook on a cookie sheet instead of in a muffin pan, and it was perfect. The foil comes right off the muffins. That is a great idea – thanks!! my mom will grease a baking pan lay whole hotdog in pan spacing them a good inch and a half apart then cover the dogs with the batter and bake at about 350 for 20 or so minutes until batter is done and golden brown u can see where the hotdogs are and cut in between they come out nice all together and then u can still dip in mustard or ketchup like the fun finger foods kids enjoy. I am going to try these tonight, but instead of muffins, I think I am just going to slice the hotdogs and put them with the cornbread in an 8×8 pan! Can’t wait!! How well did this work? I was considering doing the same thing for dinner tomorrow night! I’m losing my mind. I thought I had seen on the site a recipe using sloppy joe mix in place of the hot dogs in the muffins, but I can’t find it now to comment. We tried the sloppy joe cornbread muffins and I thought they were good. Dad and daughter also enjoyed them. My son has apparently associated cornbread with corn dogs and was thus disappointed with the offering. I did not figure this out from his comments until we were clearing the table. Suddenly, I realized he was talking about corn dogs, and the stick was integral to his definition of a hot dog. I walked to the silverware drawer, pulled out a chopstick, and skewered his muffin. His eyes lit up! Funny how putting food on a stick makes it extraordinary. Found your website via a friend. I tried your corn dog batter tonight and it was a HUGE hit! My family is just beginning the transition to whole wheat flour, so I did 2/3 cup whole wheat and 1/3 cup bread flour (all I had). Also, we are a dairy-free family in terms of milk, so I used almond milk and it came out great!!!! I WAS planning on having salad while the kids munched on these, but once I tried them I decided to splurge! I have spent a lot of time on here the past few days and I am encouraged by your meals and planning ahead type of foods. I am just starting to plan all 3 meals a day and have been very blessed by all of the time you have put into this. Thank you so much!! Your corn dogs sound delicious…..will make them this week-end for my granddaughter who loves corndogs….. I have the silicone muffins pans and they are wonderful…..you do NOT need to grease them….they just pop out and you’re not eating extra fat you don’t really need..I make cornbread muffins all the time and have never greased them….I got my pans at QVC….and I can say they have never stuck……don’t know about all silicone pans tho…. Oscar Meyer makes some really good all natural with no preservatives hot dogs now a days and they won’t break your grocery budget. I found some beef ones at Aldi for only 2.99. They also make some really good turkey ones! The best tasting turkey dogs I have ever had. My husband likes the beef ones better than any other he has had. That says a lot. I use Hodgson Mills cornmeal. It has a really good southern cornbread recipe on the bag. I use that, minus the sugar (No one in their right mind adds sugar to cornbread, it is not a dessert people, it is meant for beans and sopping up juices and lovely butter!) I add rosemary from our garden and fresh garlic to my cornbread. If you used a cast iron corn muffin pan they would never stick. You could also just make full size hotdogs in a cast iron cornbread pan and lay the hotdogs in the cornbread, all facing the center and then just cut into wedges and everyone would get a hot dog. Made corn dog muffins….I sliced up hot dogs and added to corn bread mixture and poured in muffin pans ….I used the SILICONE ones, you do not need to grease them and they just pop out…..they do not stick…..they were enjoyed by all…..will definitely make these again…..I buy self-rising corn meal mix for these…mix per directions on the pkg. Great recipe Laura, keep up the good work…. Did you cook the hotdogw before you fried them as corndogs? It might be worth mentioning that the hot dogs need to be completely pushed under and not sitting on top as pictured. Other than that, a tastey and good recipe.